This article is about the men's team. For the women's team, see Cameroon women's national football team. Cameroon played its first match against Belgian Congo in 1956, losing 3–2. They first qualified for the Africa Cup of Nations in 1970, but were knocked out in the first round. Two years later, as host nation, the Indomitable Lions finished third after being knocked out by their neighbours and future champions Congo in the 1972 Africa Cup of Nations. They would not qualify for the competition for another ten years. Cameroon qualified for its first FIFA World Cup in 1982. With the increase of 16 to 24 teams Cameroon qualified along with Algeria to represent Africa in Spain. Cameroon was drawn into Group 1 with eventual winners Italy, Poland and Peru. In their first game, Cameroon faced Peru and drew 0–0. They then had a second goalless draw with Poland before a surprise 1–1 draw with Italy. Despite being unbeaten they failed to qualify for the second round. Two years later, Cameroon qualified for the 1984 Africa Cup of Nations, held in Ivory Coast. They finished second in their first-round group before beating Algeria on penalties in the semi-final. In the final, Cameroon beat Nigeria 3–1 with goals from René N'Djeya, Théophile Abega and Ernest Ebongué to become champions of Africa for the first time. 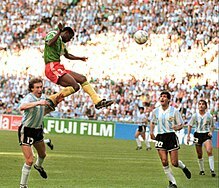 Cameroon qualified for the 1990 World Cup by surpassing Nigeria and beating Tunisia in the final round playoff. In the final tournament, Cameroon were drawn into Group B with Argentina, Romania and the Soviet Union. Cameroon defeated defending champions Argentina in the opening game 1–0 with a goal scored by François Omam-Biyik. Cameroon later defeated Romania 2–1 and lost to the Soviet Union 0–4, becoming the first side to top a World Cup Finals group with a negative goal difference. In the second round, Cameroon defeated Colombia 2–1 with the 38-year-old Roger Milla scoring two goals in the extra time. In the quarter-finals, Cameroon faced England. After 25 minutes, England's David Platt scored for England, while in the second-half, Cameroon came back with a 61st-minute penalty from Emmanuel Kundé and took the lead with Eugène Ekéké on 65 minutes. England, however, equalized in the 83rd minute with a penalty from Gary Lineker, while Lineker again found the net via a 105th-minute penalty to make the eventual scoreline 3–2 for England. The team was coached by Russian manager and former player Valeri Nepomniachi. The 1994 World Cup in the United States saw the adjustment of representation for three African teams qualify. Cameroon qualified with Nigeria and Morocco. In the final tournament, Cameroon were drawn into Group B with Sweden, Brazil and Russia. After a 2–2 draw against Sweden, Cameroon were determined to make an impact. However, a 3–0 loss to Brazil and a heavy 6–1 loss to Russia knocked them out. In their last game against Russia, the then 42-year-old Roger Milla became the oldest player to play and score in a World Cup finals match. The team was coached by French-born Henri Michel. The 1998 World Cup in France saw the increase of 24 to 32 teams. Cameroon qualified alongside four other African countries. After qualifying as expected, Cameroon were drawn into Group B with Italy, Chile and Austria. Despite drawing with Chile and Austria, a 3–0 defeat to Italy saw Cameroon finish bottom of the group, and they were eliminated as a result. It was an unfortunate elimination, since Cameroon had led Austria 1–0 until the 90th minute, and had two goals dubiously ruled out in a 1–1 draw with Chile. Cameroon had three players sent off in the course of the tournament, more than any other team, despite only playing three games out of a possible seven. They also had the highest card count per game of any team, collecting an average of four bookings in each match they played. It was also during this tournament that a certain Samuel Eto'o was exposed to Cameroonians. He was the youngest player of the tournament alongside Michael Owen of England. The team was coached by French-born Claude Le Roy. Cameroon qualified for the 2002 World Cup in Korea-Japan, clinching first place in their group which included Angola, Zambia and Togo. Cameroon were drawn into Group E alongside Germany, the Republic of Ireland and Saudi Arabia. Cameroon started with a 1–1 draw with Ireland after giving up the lead and later defeated Saudi Arabia 1–0. In their last game, Cameroon were defeated 2–0 by Germany and were narrowly eliminated by the Irish, who had not lost a game. In the 72nd minute of the 2003 FIFA Confederations Cup semi-final between Cameroon and Colombia, midfielder Marc-Vivien Foé collapsed; he was pronounced dead several hours later. In the final against France, Cameroon wore shirts embroidered with Foé's name and dates of birth and death. In the 2006 World Cup qualifying round, Cameroon were drawn into Group 3 with the Ivory Coast, Egypt, Libya, Sudan and Benin. Cameroon led the group for most of the time until their final game, when Pierre Womé failed to convert a late penalty. On 8 October 2005, Cameroon drew with Egypt 1–1 while the Ivory Coast defeated Sudan 3–1, results which prevented Cameroon from qualifying to the World Cup. In Cameroon's 2010 World Cup qualifying campaign, the team was grouped with Gabon, Togo and Morocco. After a slow start in their campaign with a loss to Togo, the coach of Cameroon, Otto Pfister, resigned. Frenchman Paul Le Guen was appointed as the new coach after a draw against Morocco. Le Guen's appointment caused an uprise in Cameroon's spirits as they earned a win against Gabon in Libreville, followed by another win against the Panthers four days later in Yaoundé. One month later, they defeated Togo in Yaoundé by three goals. On 14 November 2009, Cameroon defeated the Atlas Lions of Morocco 2–0 in Fez in their last match of their campaign. Gabon was also defeated by Togo 1–0 in Lomé. Both results caused Cameroon to qualify for the 2010 World Cup finals, held in South Africa. The Indomitable Lions were the first team to be mathematically eliminated in the 2010 World Cup, going out in their second group match to Denmark after losing 1–2, preceded by a 0–1 defeat to Japan. Cameroon used sleeveless Puma shirts at the 2002 African Cup of Nations in Mali. FIFA, however, did not allow Cameroon to use the same kits as at the 2002 World Cup, and black sleeves were added to the shirts. The 2004 African Cup of Nations witnessed Cameroon again run into controversy regarding their kits. Puma had designed a one-piece kit for the Cameroon team which FIFA declared illegal, stating that the kits must have separate shirts and shorts. FIFA then imposed fines on Cameroon and deducted six points from their qualifying campaign. Puma argued that a two-piece kit is not stated as a requirement in the FIFA laws of the game. Puma, however, lost the case in court, and Cameroon were forced to wear two-piece kits, but FIFA subsequently restored the six qualifying points to Cameroon. Cameroon started the 2002 African Cup of Nations competition with a 1–0 win over DR Congo. That was followed by another 1–0 win against Ivory Coast, and a comfortable 3–0 win against Togo. These results led Cameroon to qualify from the group stage to the quarter-finals as their group's winner. In the Knockout stage, Cameroon met Egypt in a close match that they won 1–0 by M'Boma's goal in the 62nd minute of the game. In the Semi-finals, Cameroon met the hosts Mali and won the match 3–0 to qualify to the final. On 13 February 2002, and after a close match, Cameroon won its fourth African Cup of Nations (repeating as champions), by beating Senegal 3–2 in a penalty shootout after a goalless draw to qualify for the 2003 Confederations Cup in France. Cameroon started the 2017 Africa Cup of Nations competition with a 1–1 draw to Burkina Faso. That was followed by a 2–1 win against Guinea-Bissau, and an unconvincing goalless draw against the hosts Gabon. These results were enough for Cameroon to qualify from the group stage to the quarter-finals, where they met Senegal in a close match that Cameroon won 5–4 in a penalty shootout after it had ended 0–0 after extra time. In the Semi-finals, Cameroon met Ghana and won the match 2–0 to qualify to the final. On 5 February 2017, and after a close match, Cameroon won the African Cup of Nations for the fifth time after defeating seven-time champions Egypt 2–1 in the final, by Vincent Aboubakar's late goal in the 89th minute of the match. As champions, Cameroon qualified for the 2017 FIFA Confederations Cup in Russia. Wikimedia Commons has media related to Cameroon national football team kits. The Cameroon national football team's tradition color is green. The following 23 players were called up for the 2019 Africa Cup of Nations qualification. Caps and goals are correct as of: 23 March 2019, after the match against Comoros. Players in bold text are still active with Cameroon. ^ "9 Samuel ETOO". FIFA.com. Archived from the original on 18 June 2014. Retrieved 1 March 2016. ^ "Cameroon wins Africa Cup of Nations". Daily Nation. Retrieved 2017-02-09. ^ "Top Cards – France 1998". fifa.com. Retrieved November 21, 2009. ^ "Indomitable Lions roar through to record sixth finals". ESPN. 2009-11-14. Retrieved 2010-02-04. ^ "Fifa bans Cameroon shirts". BBC Sport. 2002-03-09. Retrieved 2009-11-14. ^ "FIFA Confederations Cup France 2003". FIFA.com. 18 June 2003. Retrieved 18 June 2017. ^ "Africa Cup of Nations 2017: Cameroon 2-1 Egypt". BBC Sport. 5 February 2017. Retrieved 30 July 2017. ^ "Afcon 2017: Cameroon's Aboubakar wins final with late goal against Egypt". The Guardian. 5 February 2017. Retrieved 12 January 2018. ^ a b Mamrud, Roberto. "Cameroon – Record International Players". RSSSF. Retrieved 28 June 2018. ^ "Cameroon appoint Seedorf & Kluivert as deal for Eriksson falls through". BBC Sport. British Broadcasting Corporation. 4 August 2018. Retrieved 31 October 2018. Wikimedia Commons has media related to Cameroon national football team.